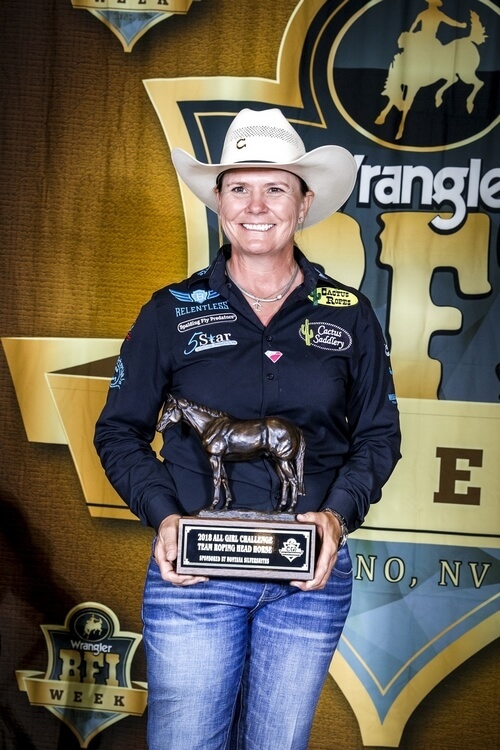 RENO, Nev. – Lari Dee Guy left no doubt about why she’s the winningest female roper of all time on Thursday during BFI Week in Reno. The horse trainer and roping clinician from Abilene, Texas, won first and second in the Charlie 1 Horse All-Girl Challenge Team Roping. She took home a total of $25,500, along with multiple saddles, buckles, spurs and the custom Montana Silversmiths bronze awarding her mare, Sabrina, as the best head horse of the roping. Wrangler BFI Week is annually held in conjunction with the “Wildest, Richest Rodeo in the West” and was live-streamed daily on www.wranglernetwork.com. It kicked off in Reno on June 18 with the 41st Annual Bob Feist Invitational (BFI) and wrapped up with the Charlie 1 Horse All-Girl Challenge. 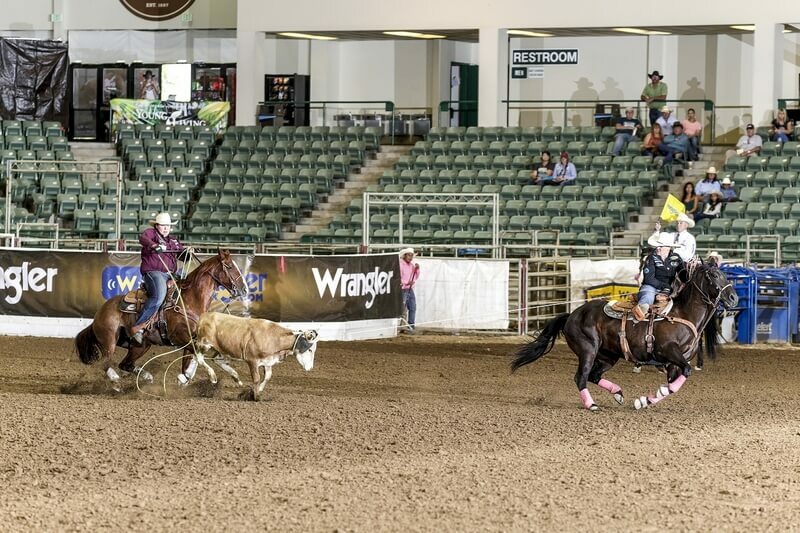 Last year, Ullman-Peterson Events expanded the annual All-Girl team roping to incorporate a #8 Incentive for ladies with lower classifications, and added the breakaway competition and all-around bonus, bringing the 2018 payout to $132,450. It was the prestigious all-girl roping here in Reno exactly five years ago that prompted Guy to coin the catchphrase “Rope Like A Girl.” The tagline is now sold on apparel and roping accessories across the country. This year, she nailed the top two call-backs in the team-roping finals. That was on the strength of catching her first three steers with Annette Stahl – last year’s champ – in 24.38 seconds, and roping another three with Whitney DeSalvo in 24.31 seconds. “Annette told me over at the stalls that it was my year this year,” said Guy. Despite Stahl taking extra time for a clean catch, their 9.26 moved them to the lead. Then Guy returned to the box and, with DeSalvo, drew a nice steer and capitalized with a quick 6.45. They won the short round and cleaned up the aggregate by a full three seconds. Guy was riding a 14-year-old black mare she owns with 23-time world champion cowboy Trevor Brazile, that came from Butch Myers originally. 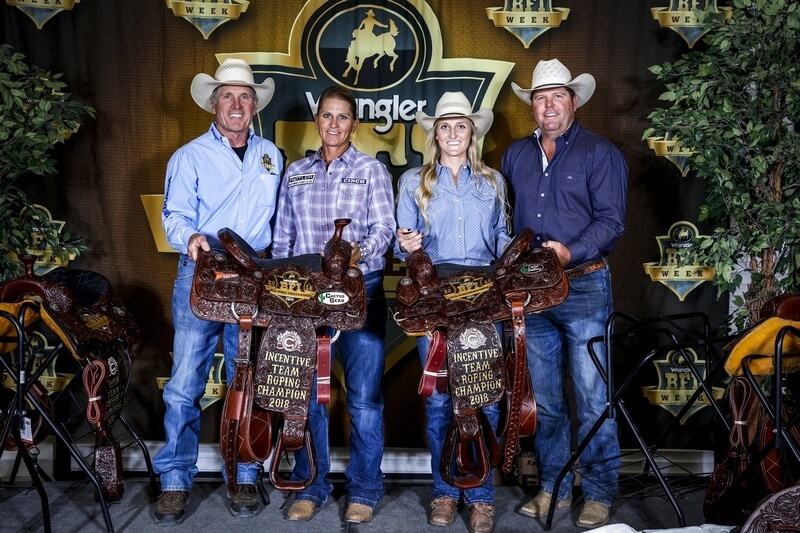 DeSalvo, the defending WPRA world champion heeler from Springfield, Arkansas, also won the Heel Horse award of the roping for her 7-year-old mare, Becky. DeSalvo attends the University of Arkansas, where she studies health and PE. She drove to Reno directly from the College National Finals Rodeo in Wyoming, where she broke the breakaway roping arena record with a 1.7-second run. Last year, DeSalvo finished third in the All-Girl Team Roping Challenge in Reno – with a cast on one hand. DeSalvo gave kudos to Guy for her consistency and her handles – especially aboard the black mare. DeSalvo was formerly only a calf roper until she noticed there was more money in team roping. 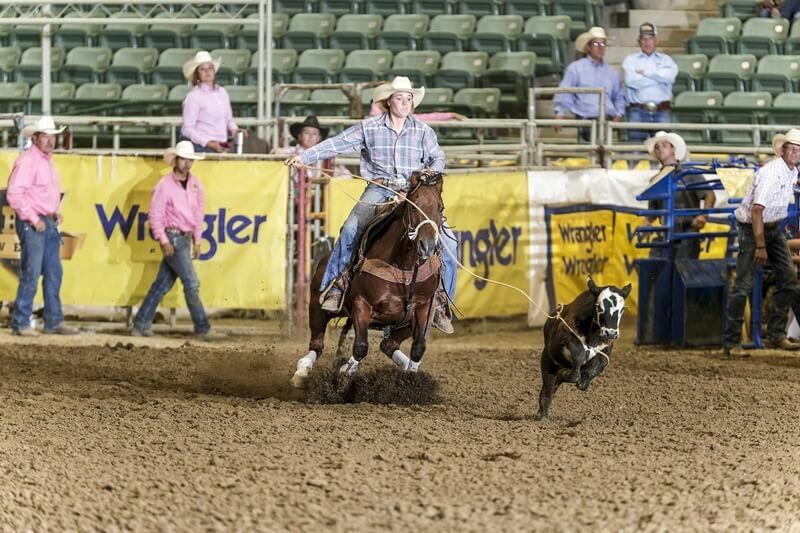 She rode heel horses for NFR heeler Shay Carroll for four months, then went to work for World No. 1 heeler Paul Eaves for a little over a year. In addition to placing fourth in the average of the Charlie 1 Horse Challenge, Lynn Smith of Cochise, Arizona, and Janey Reeves of Melba, Idaho were the champions of the #8 Incentive with their time of 44.14 seconds on four. They earned $12,000 for placing in the main roping and another $5,000 for winning the Incentive. Reeves was recruited by Smith to become a student at Cochise College, where Smith coaches alongside her husband, former NFR saddle bronc rider Rick Smith. Smith practiced this month in Wyoming with Reeves while the 22-year-old was in Casper for the College National Finals Rodeo. Annie Houston of Sutter, California, applied the heat to the high-call roper during the 2018 Charlie 1 Horse All-Girl Challenge Breakaway Roping in Reno on June 21, by winning the short round in 3.04 seconds. 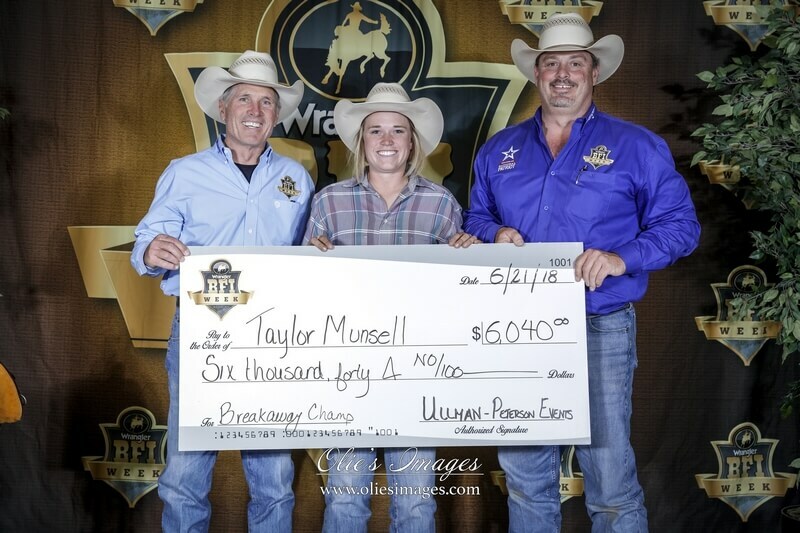 But Taylor Munsell of Harmon, Oklahoma, chased her last calf to the left and hung onto the lead with a 3.08 despite a field filled with world champs. “This morning, I wrote my goals down in my phone, and they were to win every big roping and to win the 2018 Charlie 1 Horse Breakaway,” said Munsell. She roped her three calves in 9.42 seconds to win the average and a record $7,090 plus the custom Cactus trophy saddle, buckle, and plethora of other BFI Week prizes. That total included $1,390 for topping all entries in the sidepot to qualify for RFD-TV’s The American rodeo this winter. The Charlie 1 Horse Challenge served as the first-ever qualifier for breakaway at The American Semi-Finals in 2019. Munsell had come from the College National Finals Rodeo in Casper, Wyoming, last week, where she set the short-lived arena record at 1.8 seconds for Northwest Oklahoma State University. She hauled to Reno with Whitney DeSalvo, who’d broken her record in Casper the very next night for the University of Arkansas. All contestants received Charlie 1 Horse gift bags, Sherry Cervi shirts and many other goodies in addition to bottles of wine thanks to Purple Cowboy and the “Tough Enough to Wear Pink” team-roping Wheatley family. Munsell said she expects to put a portion of the $7,090 toward her “broke-down truck in the shop at home,” and to use the rest to “keep entering.” She’ll return to the Charlie 1 Horse All-Girl Challenge next year. The following 10 women are the first to qualify for the 2019 RFD-TV’s The American Semi-Finals in Fort Worth: Taylor Munsell, Annie Houston, Kelsie Chace, Abigayle Hampton, Tracey Bolich, Lydia Townson, Nora Hunt-Lee, Jimmi Joe Montera, JJ Hampton, and Kattie Wemple. For more information, visit www.bfiweek.com. First Round: 1. Lydia Townson and Lorraine Moreno, 7.68 seconds, $1,000; 2. Taryn Krantz and Stevi Roubion, 7.83, $500; Second Round: 1. Jackie Crawford and Annette Stahl, 6.55, $1,000; 2. Megan Gunter and Kera Washburn, 6.6, $500; Short Round: 1. Lari Dee Guy and Whitney Salvo, 6.45, $1,000. Average: 1. Lari Dee Guy and Whitney Salvo, 30.76 seconds on four, $25,000; 2. Lari Dee Guy and Annette Stahl, 33.64, $20,000; 3. Brooke Jackson and Summer Tex, 41.33, $16,000; 4. Lynn Smith and Janey Reeves, 44.14, $12,000; 5. Rylea Rae Fabrizio and Lorraine Moreno, 48.30, $7,500; 6. Kylie McLean and Katie Leibold Thompson, 49.61, $6,000. #8 Incentive Average: 1. Lynn Smith and Janey Reeves, 44.14 seconds on four, $5,000; 2. Bailey Bidwell and Nicole Clarot, 60.11, $3,000; 3. Jayce Blake and Peyton Feyder, 40.99 on three, $2,000. First Round: 1. Annie Houston, 3.04 seconds, $800; 2. Taylor Munsell, 3.12, $400; 3. Bailey Kieckbusch, 3.12, $400; Second Round: 1. JJ Hampton, 2.41, $800; 2. Kelsie Chace, 2.63, $500; 3. Samantha Kerns, 2.66, $300; Short Round: 1. Annie Houston, 3.04, $500; 2. Taylor Munsell, 3.08, $300; Average: 1. Taylor Munsell, 9.42 seconds on three, $5,000; 2. Annie Houston, 9.54, $3,700; 3. Kelsie Chace, 10.07, $2,600; 4. Abigayle Hampton, 11.16, $2,300; 5. Janey Reeves, 11.63, $1,800; 6. Tracey Bolich, 11.91, $1,500; 7. Chelsey Bushnell, 12.29, $1,200; 8. Jayden Jensen, 12.65, $1,100; 9. Lilla Bell, 13.60, $900; 10. Lydia Townson, 13.87, $800. American Sidepot First Round: 1. Annie Houston, 3.04 seconds, $400; 2. Taylor Munsell, 3.12, $250; 3. Jackie Crawford, 3.26, $150; American Sidepot Second Round: 1. JJ Hampton, 2.41, $400; 2. Kelsie Chace, 2.63, $250; 3. Samantha Kerns, 2.66, $150; American Sidepot Short Round: 1. Annie Houston, 3.04, $250; 2. Taylor Munsell, 3.08, $100; American Sidepot Average: 1. Taylor Munsell, 9.42 seconds on three, $1,040; 2. Annie Houston, 9.54, $780; 3. Kelsie Chace, 10.07, $520; 4. Abigayle Hampton, 11.16, $260.